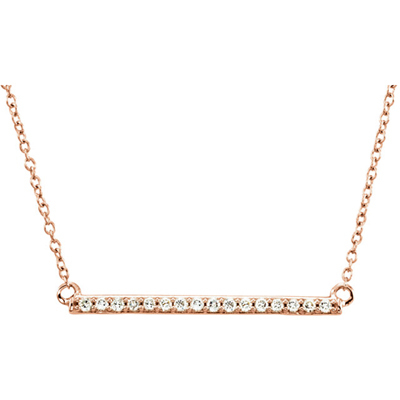 14k rose gold Slender Bar Necklace with tiny, sparkling diamonds. Dainty, Elegant & Gorgeous. Layering Necklace, or striking on its own. Delicate and Feminine, but not fussy. On trend, but timeless. We nailed it with this one. Diamond carat is 0.17 tcw. Bar measures 1.7mm x 26mm and comes with an 18 inch cable chain. 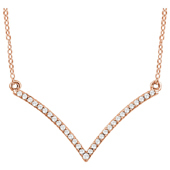 We guarantee our 1 Inch 14K Rose Gold Diamond Bar Necklace to be high quality, authentic jewelry, as described above.